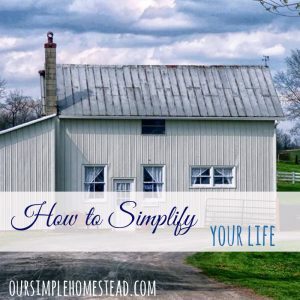 Craig and I grew up in the heart of Amish country in Pennsylvania and I have always been fascinated by their simple lifestyle. I am sure they work very hard but I have always dreamed of a day when my only job was to take care of my home and family. To spend the days baking, canning, gardening, cleaning and washing clothes is a dream come true for me. I know it sounds crazy but I really think I must have been either a pioneer woman or an Amish woman in a past life. 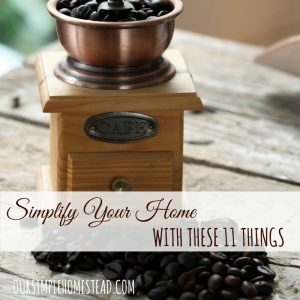 Growing up my nick name was “Suzy Homemaker.” I was the one who loved living on the farm, doing barn chores and keeping at least my side of my bedroom nice and tidy. As an adult I have always wanted to be a house wife. Don’t get me wrong Craig would like nothing more than for me to be home every day taking care of our farm but that is just not in the cards for us. Maybe someday when we are totally debt free I will have that liberty. But for now we will continue to work on being debt free and aiming to be fully self-sufficient. Since my friend Tom lost his life yesterday I spent a better part of my day thinking about our dreams and plans and how life can be taken away from us in a split second. On my drive home today I kept going over in my head just what more can we cut out and cut back on to get closer to our goals. There are so many things in life that we have been programmed to think we need…pension, insurance, television, internet, telephones, cars, radio and the list goes on and on. People have survived centuries without many of the common day necessities we think we need now. 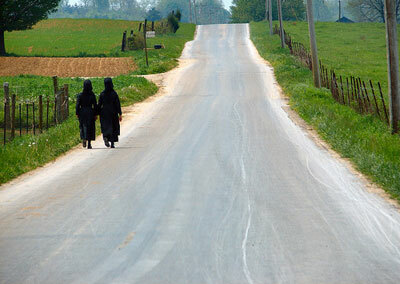 Amish don’t use electric so television, internet and radio service is not heard of which means no monthly bills for those. Insurance…do they insure their horse and buggies? Life insurance…I doubt it since their families all come together and take care of each other including their elders when they get too old to take care of themselves. Could we do without more? I am sure we could! Would it be an adjustment? Yes it would! Not sure if we could go without electric all together but we can certainly give up many everyday things that take electric. I have already given up my dryer, dishwasher and will not be putting a microwave in the new house. I am looking for a peculator coffee pot and am replacing all our clocks with wind up or battery driven ones. I am looking for a hand crank grain mill and do not use my mixer to make bread I knead it by hand. I have even been sharpening my hand sewing skills as to not use my sewing machine as much. I have to admit I would have a really hard time giving up my Internet and Craig could not live without his Sirius radio but every other electric driven appliance or device we have we are trying to replace with hand power, solar or battery operated ones. Can we give up insurance? By law not our car insurance. For our peace of mind, and to not burden our children we couldn’t give up life insurance. We have already given up on telephone land-lines and only have cell phones with the lowest plan they have. Television…I could do without the 3 Stooges and Sci-Fi movies but will have to work on Craig more on this one. We make everything homemade, buy nothing processed, don’t go out to dinner, use very little electric, make all of our own cleaning products, are gearing up to can enough vegetables to get us through the winter, are planning on a beef and dairy cow, pigs are in the future and our fruit orchard is well under way. Our second car will not be replaced unless we can pay out right for it and our new house will be run by wind, wood, and solar. We are making great strides but we still have a long way to go. It’s time to reevaluate and see what is next on the deletion list! NextThe best homemade pizza crust ever! I love this post from you. I think I could have been Amish at times. We gave up TV years ago, I think it has been good for our children and their grades, and the fact that they all have a love of reading and hobbies. We have a land line, but gave up cell phones. 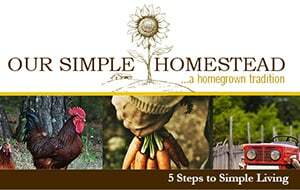 I am for the first time in my life a homemaker, but am trying to figure out a way for our farm to make money. Good luck, I’ll check in on your posts, Julie ~ Applegarth Farm. Julie I bet you are having a great time being a homemaker! There are so many things I want to do and want to try but there is just not enough time in the day with working full time. My kids are all grown so its just hubby and me but I so want to be home. My dream will happen some day and hopefully within 5 years. We are building our house paycheck to paycheck and once its complete I should not have to work full time any longer. Good luck on making your farm a working one that pays other people do it everyday so there are ways we all just have to figure it out! I used to be called little suzie homemaker! Amish people always seem so peaceful and their lifestyle calming, but I’m sure within their inner circles, they are a lively bunch! Citysister…I bet that is so true about them being a lively bunch. 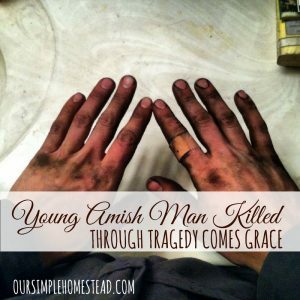 The thing that gets me is you never hear of Amish losing their homes or farms they must be doing something right and truly live within their means.